Lifehacker has some tips on how to manage a slow internet connection. It really amounts to turning off non-essential things that use your bandwidth and using more efficient means of getting what you really need. 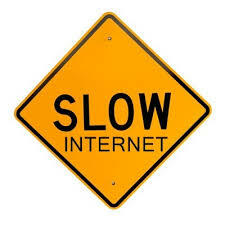 You may be in a remote place or your internet provider may have temporary slowness. If this is a chronic condition you should look at resolving the speed issue. It may take some calls to your provider. Be persistent and patient, mostly for your own sanity.